The iPhone 5 is a little taller than the iPhone4 and 4s to accommodate a larger screen but is also thinner and a bit lighter. Apple has used a new camera module in this latest version and the operating system has also been updated, integrating some new features into the camera, like panoramas. These could previously have been installed as downloaded apps, but Apple has integrated them very well. Unfortunately the issue with lens flare that showed up in the iPhone 4 and 4s is still present and seems even worse. The DxO Mark score of 72 is the same as the iPhone 4s score. This is an impressive achievement in the thinner body, but the breakdown of the scores shows some interesting differences. As a stills camera there is little to choose, but in the stabilization of video there has been a significant improvement from 28 points to 54 points, though it would have been good to see this improvement carried through to low light conditions too. This improvement in stabilization saved the iPhone 5 from having a DxO Mark Mobile score lower than its predecessor. 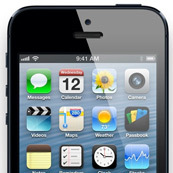 The iPhone 5 is probably the most aspirational smartphone on the market, a beautiful object in itself. The test scores also show it to be a very capable piece of photographic equipment whether used as a stills camera or to shoot video.